The Kiyosumi-Shirakawa neighbourhood opens itself up to creative events while the Museum of Contemporary Art, Tokyo is closed. The eastern-Tokyo district of Kiyosumi-Shirakawa has many charms – quaint shops, amazing temples and a vibe unique amongst Tokyo neighbourhoods. However, the small businesses, cafes and restaurants must be missing the traffic the Museum of Contemporary Art, Tokyo used to bring before its temporary closure for renovations until March 2019. Luckily this situation is being rectified through the third MOT Satellite program held all over the neighbourhood. Galleries, shops, old izakaya bars, temple walls and former factories are being taken over by exhibitions and installations with the aim of bringing the MOT Collection into the open, all under this autumn’s theme of “To Become a Narrative”. Seven MOT Spaces house the main exhibits. “MOT Spots” compliment these shows, presenting works such as “River of Colors, Colors of River”, the large banners Chika Higashi has painted on the walls of Zentokuji Temple and other buildings. Higashi’s works riff on the theme of “river”, used as the final character in the Japanese writing of Kiyosumi-Shirakawa (清澄白河). Nozomi Suzuki plays a big role in this year’s MOT Satellite. 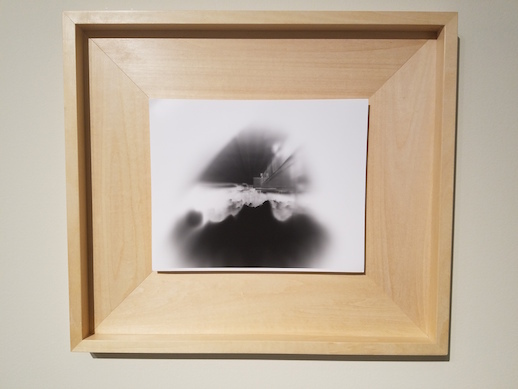 She has small displays scattered across the neighbourhood in cafes, shops, and MOT Spaces D and G. Featured are her pinhole camera prints on paper and objects, which she creates using holes encountered in daily life. 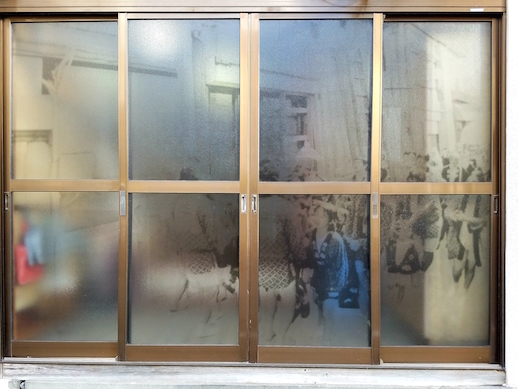 A selection of her works are exhibited in MOT Spots B, C, and E.
Suzuki thinks about what places have “seen” over time and prints these “memories” directly onto the glass of buildings. 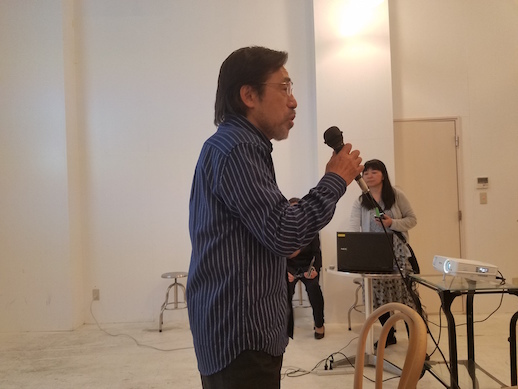 The Shirakawa Nichome Town Council Hall (Space G) has been given over for this endeavour with “The Light of Other Days” (2018). The effect is spectacular, with the main window etched with scenes of a matsuri (festival) that must have passed this building annually over decades. The imprinting of the negatives onto a building also evokes the shadows of Hiroshima. Hiroshi Shimura has opened up his gallery Grantchester House (Space B), established in in 2011, to exhibit his fish-eye lens photography. Some outstanding shots of London and Tokyo from the 1960s to the present day sit side by side. On the second floor of this unique space there is a chance to explore camera obscura and magic lanterns with digital updates, too. As well as art and photography, film plays a role in this session of MOT Satellite. A film by the pioneering Minimalist Dennis Oppenheimer from the MOT Collection is on show in the izakaya Kyu-shubo Koiji (MOT Space E), making the venue as interesting as Oppenheimer’s conceptual dances. The most relevant of the film exhibits has to be “Classic and New” by the Korean video artist Yeondoo Jung in MOT Space C. Shown on three large screens, it portrays Kiyosumi-Shirakawa through the thoughts and energies of children, long-term residents and a rakugo comedian, intertwining their stories in a visual journey through the past, present and future of this distinctive neighborhood. The MOT Space exhibits are open on Fridays, Saturdays, Sundays and national holidays through November 18. The shows at MOT Spots are viewable depending on the opening times of the venues hosting them. Friday would be the recommended day to go as it is quieter than the weekends. In any case, this movement of contemporary art outside of the museum and into the streets of one of Tokyo’s most delightful districts is highly recommended.